The Brain is who we are. Everything we sense, feel, think and perceive - occurs in the brain. The brain is made up of 86 billion neurons, which use energy to process information about perceptions, sensations, emotion & thinking. 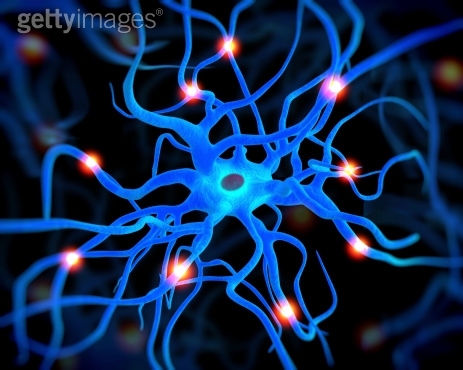 Neurons come in different shapes and sizes depending on their location and function. 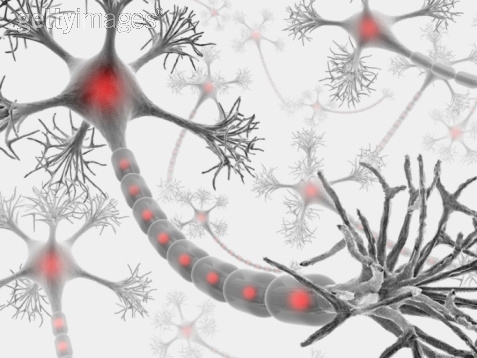 Just as people connect and communicate, Neurons in the brain connect and communicate at a special structure called the synapse. This is where the ending of one meets the beginning of the other. At the tip of the neuron, a special structure called Terminal Button has channels which are sensitive to electrical changes. When the neuron fires an action potential (electrical signal), these channels respond by allowing calcium into the cell which causes release of neurotransmitter (chemical signal). 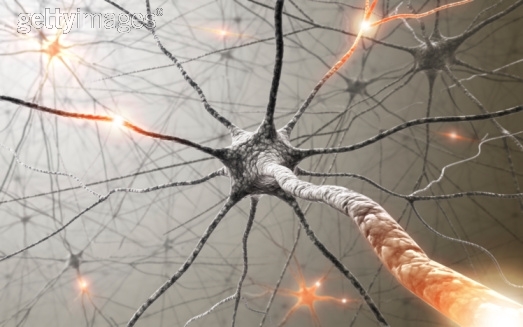 Between the two neurons there is a space called the synaptic cleft. Across this small space, neurotransmitters which have been released then diffuse, bind and result in a small change of electric current on the other neuron. This other neuron (Post synaptic neuron) experiences electrical changes called EPSP (excitatory postsynaptic potential) or IPSP (inhibitory postsynaptic potential). In certain conditions, activity at this critical place is under active, this can result in reduced efficiency of brain function and different symptoms depending on the location of the malfunction. There are many parts of the brain, but for our purposes, the most important is the Cerebral Cortex. 80% of the brain cells are in the Cerebral Cortex. It is the large, wrinkled structure that takes up most of the area in the skull. One part of the frontal lobe is worthy of our attention. 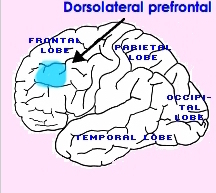 The most recently evolved and last to develop in adulthood (age 20-24) is the Dorsolateral Prefrontal Cortex (DLPFC). This part of the brain does not receive sensory information from the eyes or the ears, and it does not send motor commands to the muscles. It is the Association cortex that bridges the input and output. This is the part of the brain involved with pausing and choosing actions (Fuster 1990), holding infomation in mind aka Working Memory, (Goldman-Rakic 2006) planning and action sequencing. Injury or lack of development of this area causes problems with Working Memory, Sequencing, Flexibility, Self Control, Attention & Executive Function. It is this part of the brain that is targeted for stimulation in rTMS. By stimulating this area of the brain, depressive symptoms improve. 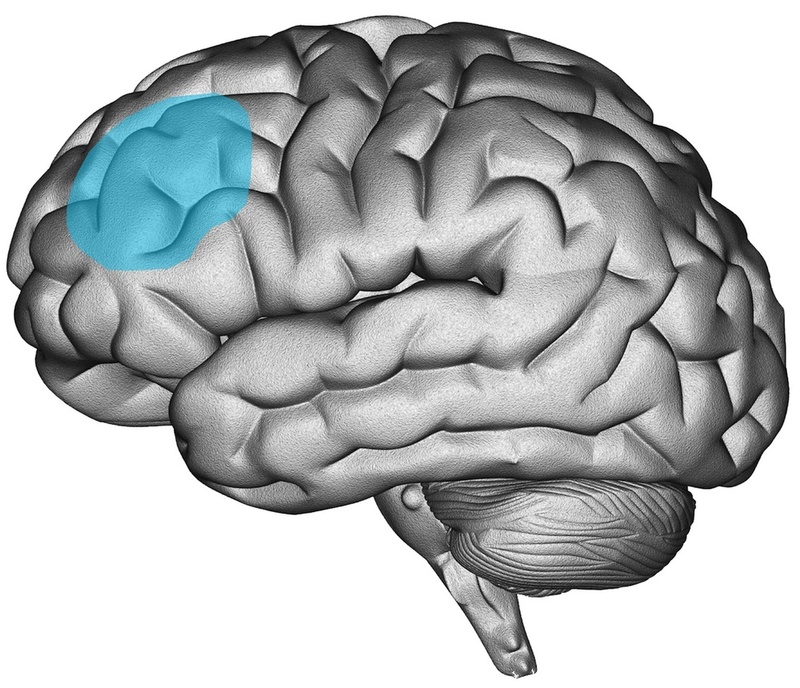 This area was chosen because of the connections it makes with two deeper areas 1) Subgenual Cortex (BA25). Subgenual Cortex hyperactivity has been associated with depression (Mayberg et al., 1999, Drevets 1997). 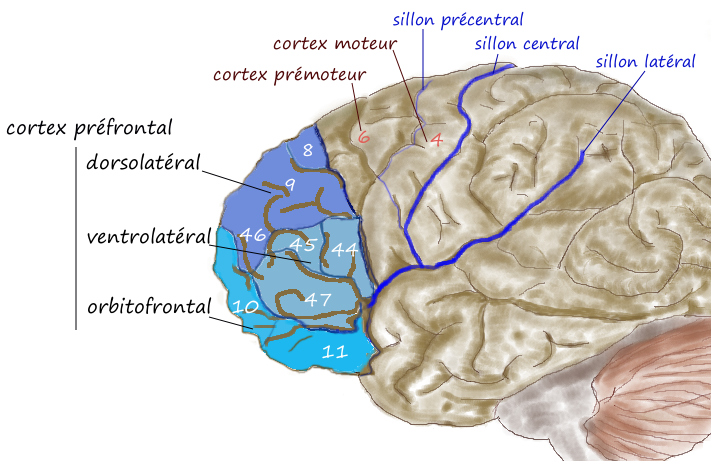 The subgenual region is strongly linked to the Ventral Striatum (Nucleus Accumbens) and orbitofrontal cortex (OFC). By stimulating DLPFC, Subgenual Cortex is inhibited which leads to mood improvement, return of interest and pleasure, better sleep and especially better concentration, memory and thinking. Self control involves being able to control attention, behavior, thoughts, and/or emotions and somehow not submit to a strong internal urge or temptation, and instead do what’s more appropriate and consistent with long term interests. If we don't develop and use inhibitory control we are controlled by impulses and habits. So, inhibitory control makes it possible for us to change our behavior, break habits, and to choose how we respond instead of being controlled by our short term feelings and thoughts. Our behavior is mostly reflexive: we see this, we think that, someone says this, we do that. But having the skill of self control lets us be aware of our feelings and thoughts without being ruled by them. This takes pause. Inhibition is essentially a form of pause. And this is what the DLPFC does. there is one kind of brain cell in the DLPFC that fires in response to what just happened and another, which fires about what the current choice that could happen next. The learned ability to pause between one and the other let’s us think about what we are about to do, to deliberate. This is the way that we exert delayed gratification. The idea of delayed Gratification emerged from the Stanford Marshmallow experiment by Walter Mischel. His group of researchers was trying to understand if and how preschool childrenresisted temptation. They gave a group of four year old children this choice: either eat one marshmallow now, or if they could wait about 15 minutes, get two marshmallows. Some kids could not resist the impulseand ate the marshmallow, but others could delay gratification and win two marshmallows. Mischel interviewed the children when they grew into teenagers and adults. He found some important and consistent patterns. The four year olds who could and would wait, were doing much better later in life. They had better grades, more friends, scored higher on the SAT, had better social skills, self-confidence and self-esteem, were more mature, coped with stress better, had more of a tendency to plan ahead, and were more likely to think about decisions instead of acting on impulse. They also had fewer behavioral problems, were more likely to follow rules instead of breaking them and less likely to be hyperactive. By the time they grew into adults, there was no question of the importance of this skill. Those kids who could wait, were less likely to have alcohol or drug problems, and had more job and relationship satisfaction. When the DLPFC is not working, or has not been trained, there is usually a self control problem. When this part of the brain is stimulated and strengthened, problems of self control are replaced with successes of self control. Working Memory (WM) is what lets us hold information in our mind and work with abstract concepts (Baddeley & Hitch 1994, Smith & Jonides 1999). The two kinds of WM are Verbal (words) and Spatial (the relationship of objects in space). WM is required for understanding what happens over time and seeing how things fit together. When we have good WM we ‘get’ the connections between events in past present and future, cause and effect and discerning what things mean. 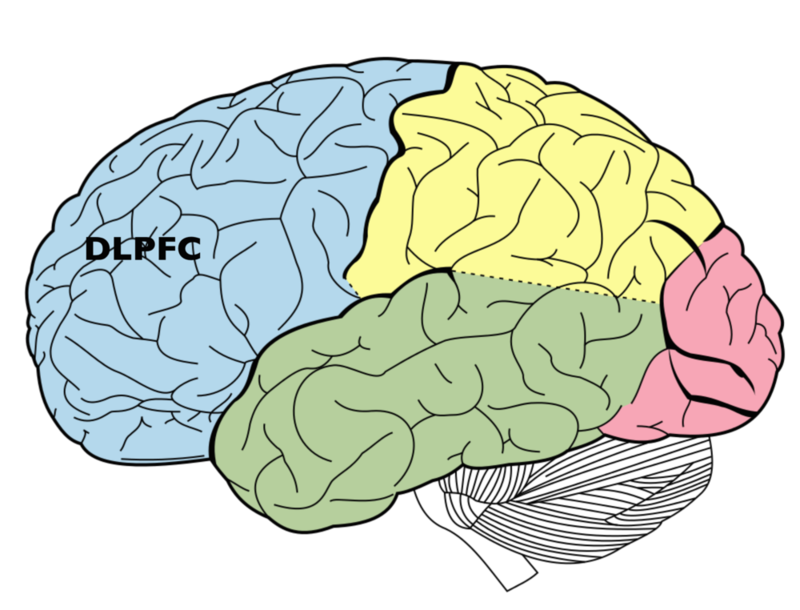 DLPFC is located in front and above the Language Area (Broca’s) which is required for coherent and fluent expression. the two areas cooperate, and DLPFC allows other brain areas to have space to combine, compare and contrast. WM is needed also for attaining goals by organizing sequences of actions to get from beginning, through the middle and achieve completion. Connecting the dots, considering different possibilities, and using the imagination to see patterns among events, ideas, words and objects are WM functions. Without good WM it is hard to see the big picture and see how the parts interact to form the whole. Art, Music and literature all require WM for their creation as well as their appreciation. When the DLPFC is not working, or has not been trained, there is usually a working memory problem. Meditation and attentional training can help develop this area of brain. When this part of the brain is stimulated and strengthened, problems of working memory are replaced with a wider perspective, increased creativity, better attention and learning. Flexible Thinking is learned at a later age than the first two (Davidson et al. 2006, Garon et al. 2008). This is the ability we are using when we look at things from different points of view. 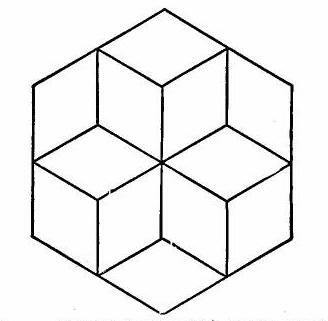 We can change perspective in space (“What would this look like in blue?” or “If the couch were over there...”) or in relationships ( “Help me understand this from your perspective”). When we shift the way we look at things, we are able to make creative and useful changes. To do this, however, we need to set aside (inhibit) the way we look at things now, for a different viewpoint, then while setting aside the way things are, we can use our WM as a place to construct a different way of approaching a situation or of understanding an issue. One can easily see how Flexible Thinking needs and is needed by Self Control as well as WM. If at first you don’t succeed, try and try again, but don't do it the same way, try something different. Problem solving often requires us to imagine new possibilities, to think outside of the box. This sort of tasks shows how challenging it can be and how much slower we go when we have confusing or contradictory inputs. Flexibility is the the ablity to do things a new way in a new situation, but you will notice, that you INHIBIT (Self Control) saying the first thought which may or may not be the correct answer, then, using WM, you recall what the instruction was (or read it again) and only then can you do the different thing. Doing one thing and then doing something else is called Task Switching, it is a form of Flexible Thinking. Discovery and invention require flexibility. When Fleming came to work at his Bacteria Lab one Monday and saw that his sandwich had grown mold, he also noticed that his strep cultures had weird no growth areas, he put the parts together and concluded that something in the mold had killed the germs, thereby discovering the first antibiotic - penicillin. An inventor named Anatole was taking a shower, and felt frustrated that if he were holding a bar of soap, he only had one more hand to turn down the cold water and turn up the hot water. It was then he thought of a shower handle that would do both at the same time. For the first image, can you see white and black arrows? In teh second can you see the faces on the sides of the goblet? How many possibilities can you see in the third? When the DLPFC is not working, or has not been trained, there is usually a reduction in Flexible Thinking. When this part of the brain is stimulated and strengthened, one would think that Flexible Thinking would improve, but so far, in my experience, brain stimulation does not improve Flexible Thinking as much as it improves Self Control and Working Memory. I'm not sure about this because I have not measured it formally. Feedback from patients who have had brain stimulation for depression routinely includes C students becoming A students, Attention Deficit vanishing and improvement or elimination of impulsivity. Your milage may vary. Working memory and executive function decline across normal aging, mild cognitive impairment, and Alzheimer's disease. Advancing understanding of executive function impairments and psychopathology: bridging the gap between clinical and cognitive approaches. Obesity-associated biomarkers and executive function in children. Computer-Based Cognitive Programs for Improvement of Memory, Processing Speed and Executive Function during Age-Related Cognitive Decline: A Meta-Analysis. The neural and genetic basis of executive function: attention, cognitive flexibility, and response inhibition. Family matters: Intergenerational and interpersonal processes of executive function and attentive behavior. The emergent executive: a dynamic field theory of the development of executive function. The early development of executive function and its relation to social interaction: a brief review. Prefrontal cortex and executive function in young children: a review of NIRS studies. Behavioral Sleep Problems and their Potential Impact on Developing Executive Function in Children. Language, executive function and social cognition in the diagnosis of frontotemporal dementia syndromes. A role for synaptic plasticity in the adolescent development of executive function. The relationship between executive function and falls and gait abnormalities in older adults: a systematic review. One hundred years ago a psychiatrist in Germany (Paul Flechsig, MD (1847-1929) noticed that the cortex did not all myelinate at the same time, but developed in a certain sequence which appeared analogous to the evolution of the brain. The first parts of the brain which myelinates we share with the most primitive mammals, these are the basic input-output areas of face, arms, legs etc. The last to develop are those areas which make us the most human - the "Higher Functions" such as creativity, intelligence, memory, planning and sequencing. He numbered the areas and made a map of the brain from area 1 to 45. 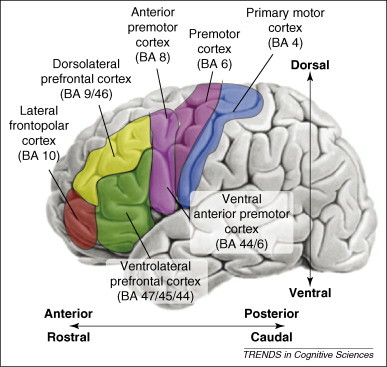 This map of the brain points us to pay attention to the Dorsolateral Prefrontal Cortex (Flechsig #45, Brodmann's areas 9 & 46) and the Frontal Pole (Flechsig #45, Brodmann's area 10). In the century that followed, this last area has been studied extensively. Fig. 3. The influence of left dorsolateral prefrontal cortex (DLPFC) on the correlated activity between the dorsomedial midbrain and medial thalamus during heat allodynia. Upper right graph shows the negative correlation between activity in the left DLPFC and each subject’s rating (VAS) of pain unpleasantness during heat allodynia. A median split of DLPFC activity defines high (filled circles) and low (open circles) activity levels. The lower right graph shows the strong positive midbrain-thalamic correlation when DLPFC activity is low and a lack of significant correlation when DLPFC activity is high. The diagram (left) summarizes one interpretation of this relationship. Midbrain and medial thalamic activity are uniquely activated during heat allodynia, which is associated specifically with increased pain unpleasantness (compared to normal heat pain). The left DLPFC, while also activated in this condition, is negatively correlated with pain unpleasantness. Our analysis of these results is consistent with the interpretation that the left DLPFC actively reduces pain unpleasantness (affect) by reducing the activity ascending from the midbrain to medial thalamus during heat allodynia. What saccadic eye movements tell us about TMS-induced neuromodulation of theDLPFC and mood changes: a pilot study in bipolar disorders. 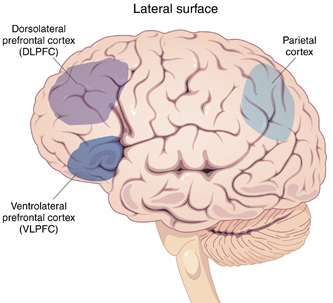 Activity in dlPFC and its effective connectivity to vmPFC are associated with temporal discounting. TMS affects moral judgment, showing the role of DLPFC and TPJ in cognitive and emotional processing. Is there "one" DLPFC in cognitive action control? Evidence for heterogeneity from co-activation-based parcellation. Application of high-frequency repetitive transcranial magnetic stimulation to theDLPFC alters human prefrontal-hippocampal functional interaction. Harnessing electric potential: DLPFC tDCS induces widespread brain perfusion changes. BDNF polymorphism-dependent OFC and DLPFC plasticity differentially moderates implicit and explicit bias. Impulse control and underlying functions of the left DLPFC mediate age-related and age-independent individual differences in strategic social behavior. Stop and be fair: DLPFC development contributes to social decision making. Functional disconnection and compensation in mild cognitive impairment: evidence from DLPFC connectivity using resting-state fMRI. Working memory and DLPFC inefficiency in schizophrenia: the FBIRN study. Elevated GRIA1 mRNA expression in Layer II/III and V pyramidal cells of theDLPFC in schizophrenia. AMPA receptor subunit and splice variant expression in the DLPFC of schizophrenic subjects and rhesus monkeys chronically administered antipsychotic drugs. Does non-invasive brain stimulation applied over the dorsolateral prefrontalcortex non-specifically influence mood and emotional processing in healthy individuals? Decoupling of N-acetyl-aspartate and glutamate within the dorsolateral prefrontalcortex in schizophrenia. Short-Term Memory Impairment and Left Dorsolateral Prefrontal CortexDysfunction in the Orthostatic Position: A Single Case Study of Sinking Skin Flap Syndrome. Differential roles of delay-period neural activity in the monkey dorsolateralprefrontal cortex in visual-haptic crossmodal working memory. Post-training cocaine administration facilitates habit learning and requires the infralimbic cortex and dorsolateral striatum. Motivation and affective judgments differentially recruit neurons in the primate dorsolateral prefrontal and anterior cingulate cortex. Selective increase of intention-based economic decisions by noninvasive brain stimulation to the dorsolateral prefrontal cortex. 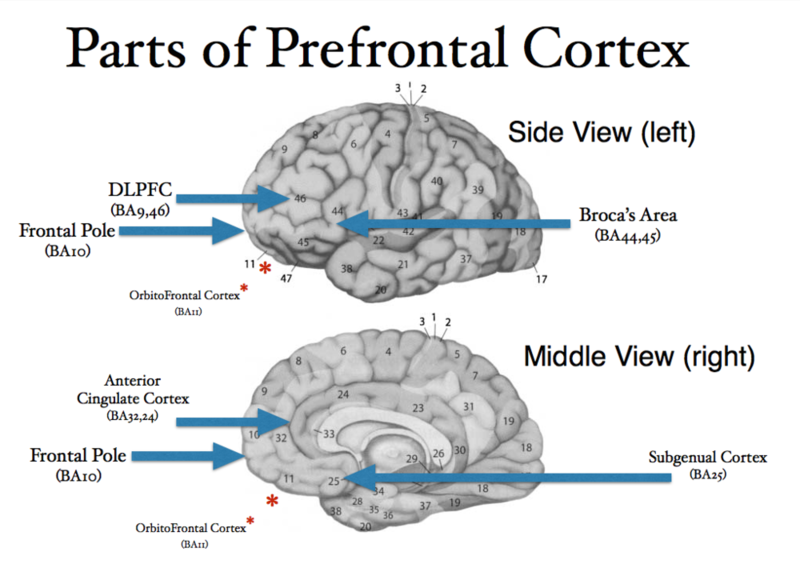 Converging structural and functional connectivity of orbitofrontal, dorsolateral prefrontal, and posterior parietal cortex in the human striatum. Contribution of NMDA receptors to dorsolateral prefrontal cortical networks in primates. 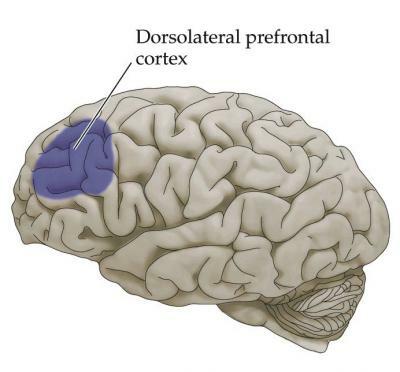 Dorsolateral-ventromedial prefrontal cortex interactions during value-guided choice: a function of context or difficulty? Reward feedback stimuli elicit high-beta EEG oscillations in human dorsolateral prefrontal cortex. Analgesic effect of cathodal transcranial current stimulation over right dorsolateral prefrontal cortex in subjects with muscular temporomandibular disorders: study protocol for a randomized controlled trial. Comparison of Metabolite Concentrations in the Left Dorsolateral PrefrontalCortex, the Left Frontal White Matter, and the Left Hippocampus in Patients in Stable Schizophrenia Treated with Antipsychotics with or without Antidepressants. ¹H-NMR Spectroscopy Study. Adding Sarcosine to Antipsychotic Treatment in Patients with Stable Schizophrenia Changes the Concentrations of Neuronal and Glial Metabolites in the Left Dorsolateral Prefrontal Cortex. Physiological approaches to understanding molecular actions on dorsolateral prefrontal cortical neurons underlying higher cognitive processing. Enhanced control of dorsolateral prefrontal cortex neurophysiology with real-time functional magnetic resonance imaging (rt-fMRI) neurofeedback training and working memory practice.